The new West Texas Food Bank facility has a dedicated client service area to help fulfill patrons’ nutritional needs. West Texans fighting food insecurity have a new resource to combat hunger. The West Texas Food Bank held the grand opening of their new 60,000 square foot location during a recent ceremony in Odessa. In operation since 1985, the West Texas Food Bank saw the need for food grow exponentially in their communities, requiring them to expand their services. The new facility replaces the East 2nd Street building, and is a first-of-its-kind in West Texas. Thanks to generous donations from area philanthropists committed to fighting hunger locally, the facility will help meet the nutritional needs of more than 31,000 people living in poverty or food insecurity in Midland County, while serving 18 other West Texas counties. 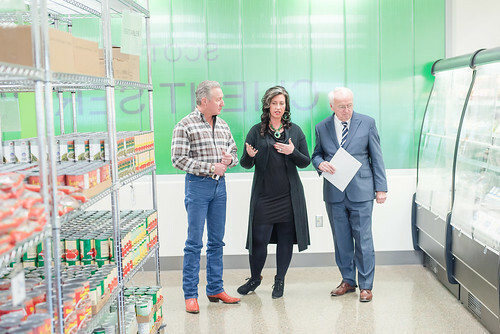 According to the West Texas Food Bank Executive Director, Libby Campbell, the new facility offers more program opportunities for seniors, children, families and the homeless. Kevin Concannon, USDA Under Secretary for Food Nutrition and Consumer Services, had the opportunity to tour the food bank and spoke at a special ceremony commemorating the historic accomplishment. While there, Concannon praised the West Texas Food Bank for ensuring people in the area are able to access fresh produce and nutritious foods. He also commended the hard work and planning it took to raise funds and design a building that will benefit the community for years to come. The facility houses a state of the art kitchen, which they will use for their Kids Café to prepare meals for the Summer Food Service Program and the Child and Adult Care Food Program. It also contains a 3,200 square foot freezer/cooler which allows them to hold almost three times more cold storage items than the previous location. The expanded facility provides additional storage room for dry goods, as well as volunteer areas to assist with sorting donations and holding meetings. In addition to the expansive indoor area, they’ve planned an outdoor garden to grow fresh vegetables. Representatives from the food bank are confident the new facility will have a big impact on the communities in West Texas. And we couldn’t agree more.